MIDNIGHT and I’m hanging around in a dark car park waiting to meet a group of strangers. Money had already changed hands. Now before you start jumping to wild conclusions, I should point out this was part of my remit for the Arran Mountain Festival. 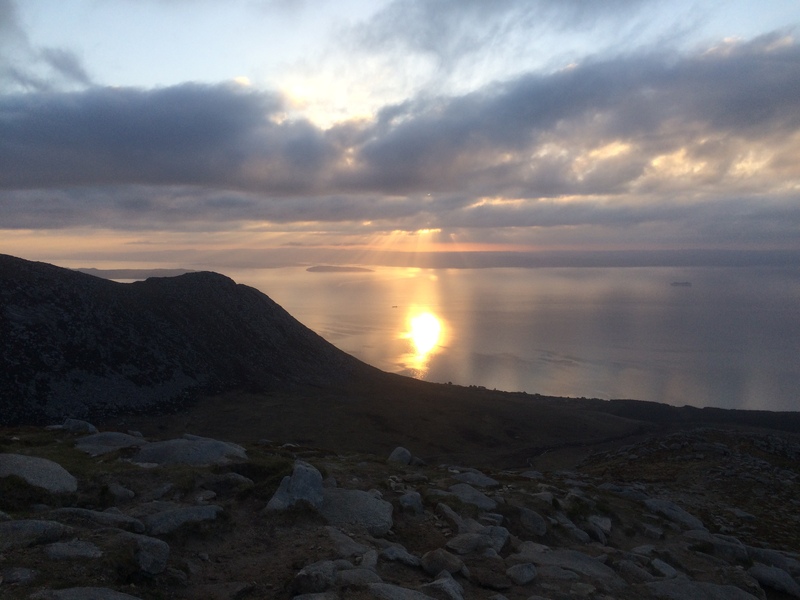 I was helping lead Moonwalker night excursions up Goatfell for those wanting to catch the sunrise from the island‘s highest peak. The first scheduled walk had proved popular, selling out within an hour or so of being advertised, that a second date was added. In all the years I have been night walking, I have been accompanied by just a handful of people. Now here I was, standing in the moonlight at Cladach, ready to co-lead groups of eight paying customers on a nocturnal mountain experience. It was a new departure for the Arran festival, which has gone from strength to strength since its inception ten years ago. A variety of walks are held over four days, everything from nature rambles to serious ridge scrambling, and places are snapped up fast. There’s a real community spirit about this festival; everyone pitches in, from the mountain rescue team and local guides offering their services, to those providing logistical support such as free accommodation and organising the social activities. 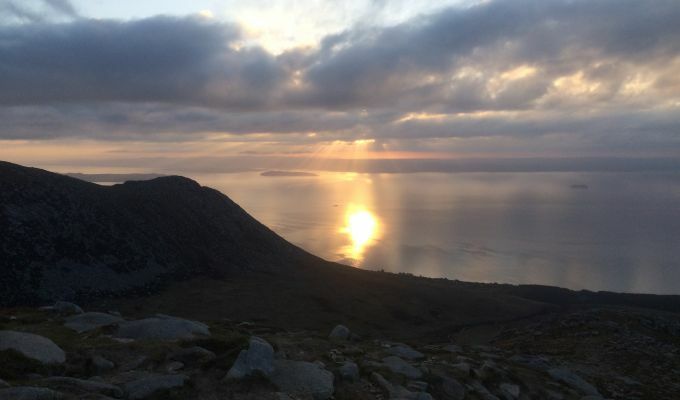 I had arrived on the Friday for the meet and greet reception before heading off to prepare for the first night ascent of Goatfell. We started walking just after 1.30am from the High Corrie path, a steady pull up to the ridge just to the north of North Goatfell. The moon was obscured by clouds but the higher we rose, the more discernable the mountain shapes became, the more the darkness broke into layers. Night turned to day during a short break among a jumble of huge boulders, a rock promenade which allowed the full breathtaking sweep of Glen Sannox and Glen Rosa to be taken in. We sat at the summit and watched a sliver of red burst through the horizon, growing and glowing as it rose. The mist that swirled out and in tried its best to obscure the show but the sun always comes through and the collective sighs of appreciation showed the night had been a success. Just 48 hours later and I was back up the same route with another intrepid band buzzing with excitement. We had a clear moon and a full field of stars most of the way but it clouded over just before the ridge. The great reveal of the ridge was less spectacular his time but then daylight seemed to arrive in more of a hurry and by the time we summited the view of the surrounding hills was crystal clear. A line of cloud on the horizon blocked the first glimpses of the sun rising, but eventually the brilliant light overpowered its captor and treated us to a blinding golden backlight. Another set of satisfied customers. Our times and weather conditions for the two walks had been almost identical, yet we had encountered different sunrises and levels of visibility. Nature just does its own thing - you could visit the same mountain for a whole year and still find that every day provides something different, changing seasons, changing moods, changing skies. The problem with doing two night walks so close together though, is what do you do in between? Big mountain walks are out, as the recovery times are not realistic. I chose to take the little ferry from Lamlash over to Holy Isle and spent a few hours in the sunshine exploring this Buddhist retreat. 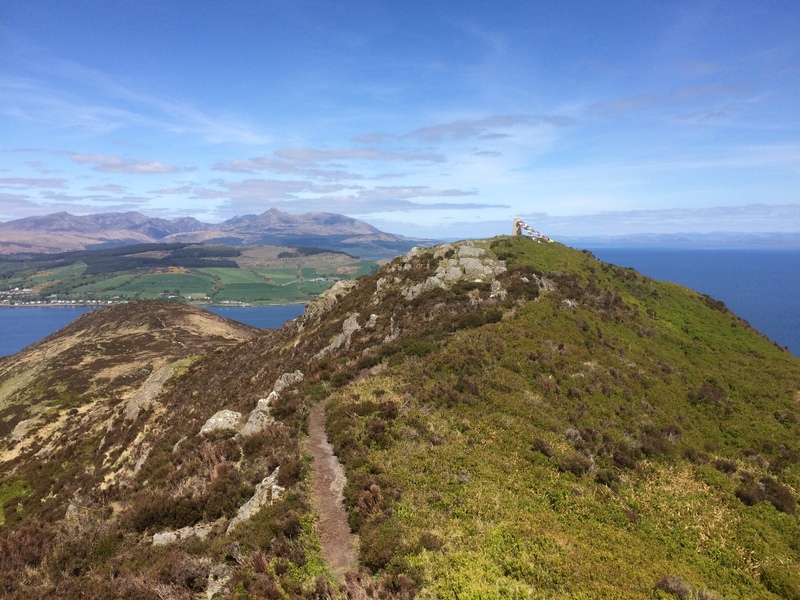 The highest point, Mullach Mor, can be reached in little over an hour and gives wonderful views of the Arran hills. The summit trig point is adorned with prayer flags and I found a certain peace in lying stretched out on a large, flat rock drinking in the rays of the sun. Ailsa Craig was a hazy blue beehive off in the distance. The relaxation therapy continued with the walk back along the water, Soay sheep and ponies roaming free, gulls and oystercatchers nesting amongst the rocks on the shoreline. The Arran festival has become a permanent date in my diary. I hope to see you there next year.